Have I mentioned how much I used to really dislike sweet potatoes? Now, they’re my absolute favorite side dish. 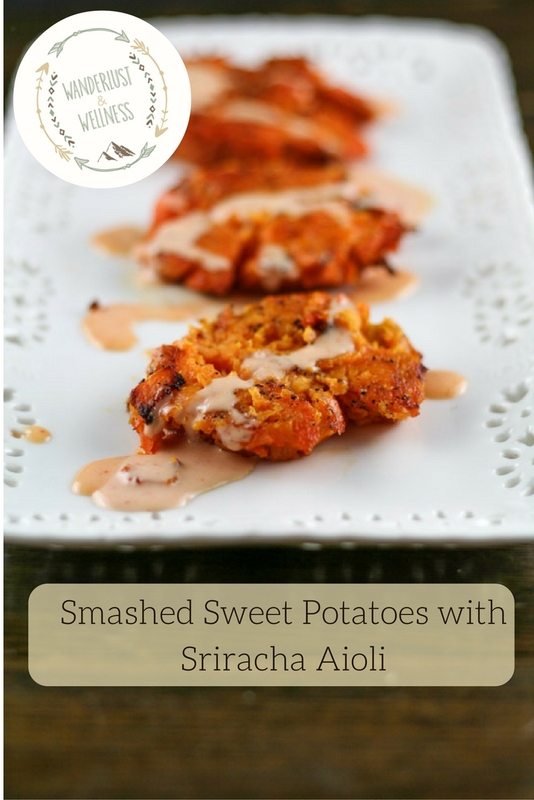 These smashed sweet potatoes paired with the sriracha aioli I mentioned in the Paleo tuna cakes recipe is like a match made in heaven. I served these the same night as the tuna cakes and I probably could have eaten all of them. Give me all the smashed sweet potatoes!! 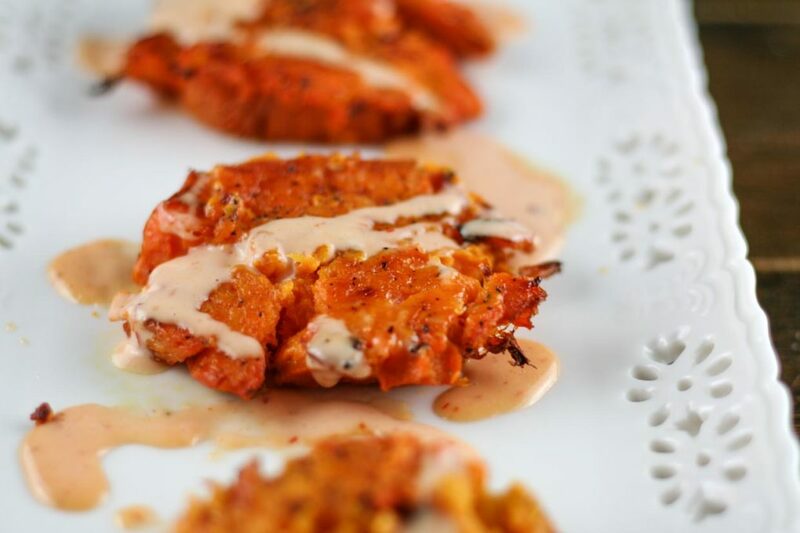 If sweet potatoes are not you’re favorite, keep trying them in different ways. What helped me was adding spices and changing how I cooked them. Eating healthy is all about trying new foods and cooking in new ways until you find what you like! You will not find me eating candied yams with marshmallows, I find those disgusting. 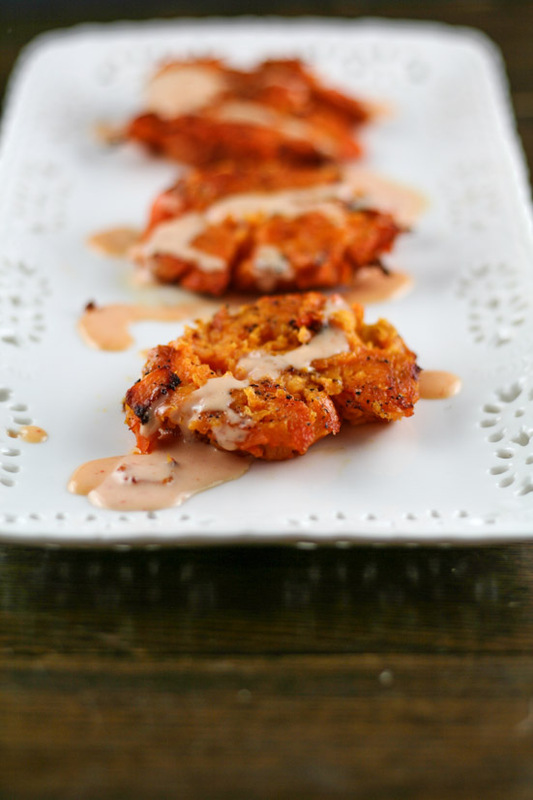 I will, however, chow down on some homemade spicy sweet potato fries or these smashed sweet potatoes drizzled with sriracha aioli. Adding a little pink Himalayan salt and pepper to the sweet potatoes makes all the difference in the world to me. I also sometimes add in some cayenne pepper, but that wasn’t needed this time with the sriracha aioli. Sweet potatoes are also an excellent source of Vitamin A, providing over 400% of your daily Vitamin A needs. They are full of fiber and potassium. 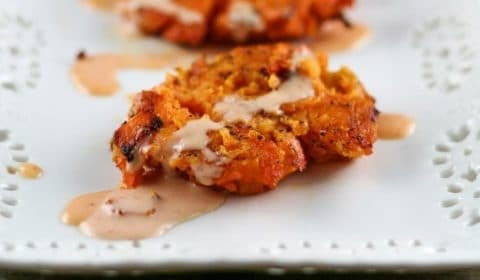 Sweet potatoes are also a complex carb, which basically means they are made up of fiber and nutrients, they take longer for your body to digest (compared to simple carbs) and the best part….they do not raise your blood sugar like a simple carb would. So there’s no sugar crash when it comes to these carbs. And remember, carbs are NOT the devil, it’s the quality of the carbs and quality of the foods that matter. Complex carbs also provide fuel to your body to be used with energy production. Now, on to the recipe! Preheat over to 410 degrees F.
Peel the potatoes and but into 3/4 inch slices. Add sweet potatoes and boil for about 30 minutes or until very soft. Drain sweet potatoes and all them to cool. While potatoes are cooling, line a baking sheet with parchment paper or some other sheet liner. Carefully place the potato slices onto the lined baking sheet. Using a fork, gently smash them in the middle. You’ll want to keep them mostly intact. If they break apart, just gently push the pieces back together. Lightly drizzle the potatoes with olive oil and then season with salt and pepper. Bake for 15 minutes, then carefully flip each potato and bake for 20 more minutes. You’ll want to try to get the edges crisp. While potatoes are cooling, add all sriracha aioli ingredients to a small mixing bowl and whisk together. Drizzle potatoes with aioli just before serving.